NEW! 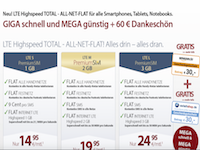 LTE high-speed TOTAL All-Net-Flat: GIGA quickly and MEGA low + 60 EUR FREE Gift. Everything you need - all tuned for smart phone, tablet, notebook. Free in all mobile networks. Free calls to German landlines. Free SMS to all networks: 3GB, 2GB, 1GB to choose from only 14,95 EUR per month. Super fast with up to 50MB per second. Fixed fee of EUR 29.00 per successful order.